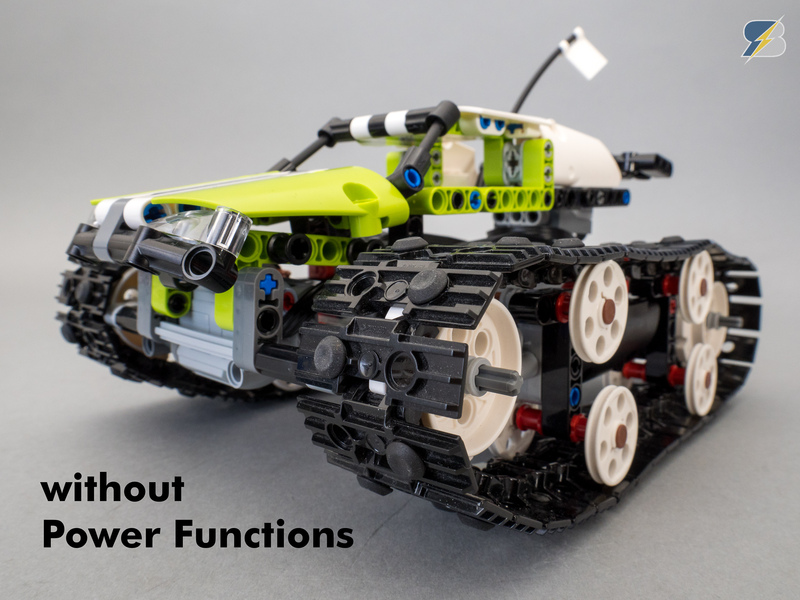 The LEGO® Technic 42065 RC Tracked Racer is one of the rare sets that is remotely controllable out of the box with the necessary Power Functions elements. It is a very good introduction to the world of Power Functions, but it has some room for improvement - the speed is pretty decent but the climbing abilities can be enhanced. I created several versions to build the fastest or the strongest one (you can see a video here), and now I decided to create a well balanced version which runs as fast as the original but has much better climbing abilities. I removed the M motors and installed 2 L motors, the structural integrity is improved with the motors secured in place at multiple points. The tracks have a much better performance with the rubber attachments and they don't slip on hard floor like the stock version. Please note that this pack does not contain the 2 Power Functions L motors that are required to complete this modification! If you would like to purchase the complete pack please click here. Please note that the upgrade pack does not contain pieces to change the body, the color variations you see in the video are for identification purposes only.